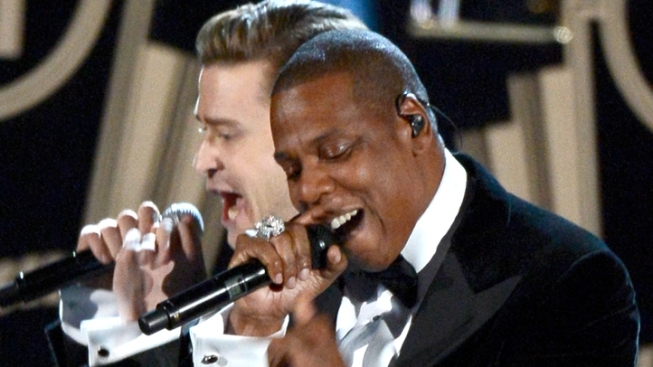 Singer Justin Timberlake (l.) and rapper Jay-Z perform onstage at the 55th Annual Grammy Awards at Staples Center on February 10, 2013 in Los Angeles, California. The search is over...at least for the music video of Jay Z's "Holy Grail," featuring vocals from tour mate Justin Timberlake. The clip for the first single off H.O.V.A. 's 12th studio album, Magna Carta Holy Grail, premiered today exclusively on Jay Z's Facebook page and shows the rap kingpin in fighting form, not only dropping references to Mike Tyson, but sampling Nirvana's anthem "Smells Like Teen Spirit." "Bright lights is enticing/But look what it did to Tyson/All that money in one night/30 mill for one fight," Jigga rhymes about the misfortunes fame can bring. While J.T. sings the bridge from the legendary grunge band's mega-hit and has a number of soulful verses interspersed throughout, albeit disjointedly given the stop-start nature of the vid, There are also various moments where Jay Z's voice is intentionally slowed down--as if to emphasize the serious subject matter he's rapping about. But "Holy Grail" excels at stringing together a series of moody cinematic images however, including a shot of Timberlake wandering around a beautifully lit hall surrounded by ghost-like dancers covered in white sheets and crooning before a wall of flames. The video is the first to premiere on Facebook's new proprietary video player and will run on the social network for 24 hours before going out to YouTube and other video sharing sites on Friday at noon. The social media blitz is a worthy follow up to Jay Z's innovative marketing launch for Magna Carta. The latter saw the MC strike a deal with Samsung to give away 1 million advanced copies of the record to Samsung Galaxy smartphone customers, a strategy that helped draw attention to Magna Carta and spur its debut at No. 1 on the Billboard charts with 527,000 in sales.